The weekend just passed saw the annual NZ Skeptics Conference 2013, held in my home town of Wellington. The theme was around science communication, and speakers featured such stars as Pamela Gay and Kylie Sturgess, as well as local speakers such as Martin Manning and fellow Scibloggers Siouxise Wiles and Elf Eldridge. For some unfathomable reason, I was asked to speak too. I was told it was because of experience in and around community stuff with nerds (both science and other), and so my talk focussed on that. Hi everyone 🙂 I’m aimee. I hope you’ve had a great time so far! Some fascinating people here this weekend 🙂 It’s a great community, this one! Forming communities around interests and beliefs is pretty common behaviour amongst people. Before we go further, though, I should probably explain what I mean by nerd. Over the years I’ve heard and been part of a number of hilarious debates about the differences between nerd, geek and dork. I’ve had my own pet theories, and vociferously defended them. How do I define nerds/geeks/dorks? These are people who are hugely passionate about a particular subject, be it Star Trek’s linguistics, the fundamental basics behind how our universe works, or what the perfect piece of yarn to use is. People who make things – whether it’s knowledge or something more physical. And one of the things they most like to make is communities. Sometimes these communities are physical, and sometimes they’re virtual. More often than not, they’re a mixture of both. Today, I thought I’d point out a few of the communities out there, and then choose a couple with a strong science communication focus to talk about a little more. Finally, I figured I’d share some pointers, based on personal experience, on things to think about when setting up a nerd community of your very own. I’ve had a look for data about this, and, well, it’s not really there. But I do know that nerds and nerd communities are EVERYWHERE, and the internet has been an enormously powerful and positive force in bringing people together – people who might otherwise have believed they were alone. Whatever you’re interested in, I can guarantee you could have a bit of a google and find at least one community devoted to that thing. Compost, perhaps. Or trains 😛 Or knitting! Or specific films and TV series – Star Trek and Firefly spring to mind. a global phenomenon in which speakers get up to speak to audiences about subjects about which they’re passionate. The difference? The venue and the feeling – rather than being staid lectures, audiences can eat and quaff beer, get to know each other and the speakers, and the feeling is informal and approachable. A very powerful ‘hacktivist’ group which goes after anyone it believes may be threatening freedom. The group has become well known for a series of well-publicized hacks and distributed denial-of-service (DDoS) attacks on government, religious, and corporate websites . Love them or hate them, Anonymous certainly has an impact! Written by PZ Myers, this blog has become hugely influential in science communication and atheist circles. It discusses many issues, but is particularly known for its criticisms of creationism and intelligent design. It’s one of the most popular science and atheist blogs in the world, and it and Myers have won numerous awards, and attracted a lot of attention. The largest science blogging network in Australasia, with over 30 bloggers and tens of thousands of views a month . Scibloggers cover a range of topics, and the network itself continues to grow in influence. The bigger brother of SciBlogs, ScienceBlogs is based in the US and claims to be ‘the largest online community dedicated to science’ . Now in its 7th year, Science Online is an annual conference, held in the US, which brings together scientists and science writers from all over the world who’re interested in science communication, and especially online forms such as blogging. Delegates often describe it as mind-blowing, and hugely inspirational. Every year there are more of these, which is fantastic. As defined by Wikipedia, “Citizen science, also known as crowd science, crowd-sourced science, or networked science), is scientific research conducted, in whole or in part, by amateur or nonprofessional scientists, often by crowdsourcing and crowdfunding” . Citizen science projects cover astronomy, neuroscience, exobiology and more, and have had measurable outcomes. And of course, the Skeptics societies all over the world! I could list awesome communities to go check out for ever 🙂 But now I’ll dive in a little deeper. And I’m going to look at nerd communities which focus, in particular, on science communication. “ Science is driving our conversation unlike ever before. A public that better understands science and its implications is better placed to ensure its governments and representatives, as well as itself, make the best decisions possible about the so-called ‘wicked problems’ which are facing us and our planet. As I mentioned earlier, Nerd Nite is a global speaking event. It was started in 2003 in Boston. Chris Balakrishnan, a doctoral fellow at Harvard, had been spending so much time at his local bar talking about his work researching the parasitic finches of Cameroon that the bartenders asked him to give a presentation on it for his friends, in the hopes he’d stop going on about it . Now, it’s everywhere. It’s spread to over 60 cities all over the world . You’ll notice NZ has two dots – I’m proud to say that Nerd Nite Wellington, which I founded and host (and to which about 100 people come each time), was the first Nerd Nite chapter in the Southern Hemisphere. NZ now also has an Auckland chapter! The only thing required to be a speaker is passion about a subject – we’ve had talks on everything from zapping brains with electricity to geoengineering, and a tonne besides. And the only thing required from the audience is open ears and the willingness to learn about new things. I’ve spoken to Nerd Nite bosses around the world about the effects of Nerd Nite on the greater community, and here’s some of what they said about what Nerd Nite achieves. Several couples have even met and got married because of Nerd Nite! Here in New Zealand, I’ve noticed that it ties together a hugely diverse group of people…I’ve organized 18 events, with about 100 people coming along to them each time, over more than three years. The Nerd Nite Wellington audience includes people who’re in their teens, right up to people who retired some time ago. It includes scientists, devs, technologists, writers, artists and more. And, I’m proud to say, our last Nerd Nite Wellington event, in August, reached gender parity – we had as many women in the audience as men, which is pretty unusual in science-related things of this sort! Next, Sciblogs. It’s an online community dedicated to the communication of science in NZ. It was started in 2009 by the Science Media Centre (of which I was at the time a part) as a means of communicating science to the public and journalists, providing expert commentary on science-related subjects of interest, and grooming scientists to become the sorts of writers who could end up with columns and articles in the main stream media. It has 33 blogs  covering everything from microbiology to economics, nutrition to sleep science, and it gets well over 30,000 visits a month . And, some of them end up doing very direct science communication – for example, Siouxsie Wiles, who’s on next! How has Sciblogs had an effect, though? It’s helped improve public discourse and helped members of the public gain a stronger grasp of the facts, and how science works. It’s helped to demystify scientists and their work, making them more accessible and approachable (which is good for everyone). It’s provided a place for people like Shaun Hendy, who just published a book he co-wrote with Sir Paul Callaghan , a place to begin their musings. It’s helping the public understand our own wildlife better – for example, David Winter’s awesome blog about the sequencing of the Tuatara genome. And it’s been a successful model demonstrating to science organisations and scientists throughout the country that fronting up to the public can be far more powerful than hiding from it. Another community dedicated to the communication of science, ScienceOnline is focused on an annual conference – now with over 400 hundred attendees! – that looks at the role of the internet in science and science communication. It brings together a diverse, and growing, group of researchers, science writers, artists, coders and educators – all of whom are people who conduct or communicate science online – for meaningful, face-to-face conversations about the issues. The community is a global one, and all with the goal of better science communication within the science community, with the public, and with policymakers. In the seven years it’s been running, the conference has energised thousands of people to communicate their science online. Citizen science may be a new term, but it’s an old practice. In fact, it was only in the mid 20th century that scientific research came to be dominated by professional scientists, with a lot of attendant criticism. As a result, citizen science has been referred to as ‘the democritisation of science’. As I mentioned, there are oodles of these projects around, involving hundreds of thousands of people. They include CosmoQuest, of course, and projects like FoldIt (protein folding), EyeWire (mapping the 3D structure of neurons) and Field:Expedition Mongolia (in which people help identify possible sites for the lost tomb of Chinggis Khan for National Geographic by tagging satellite photos). I won’t talk about CosmoQuest here – Pamela is the person best qualified to do that 🙂 So I thought I’d mention a couple of others, and their impacts. First, we have FoldIt. This is probably one of the most famous examples. It’s an online puzzle game which gets people – over 100,000 of them so far! – to fold selected proteins to the best of their ability, and rated these efforts. The best solutions are then looked at by researchers to see whether they had real-world solutions. Many did. In 2011, players of Foldit helped to decipher the crystal structure of the Mason-Pfizer monkey virus (M-PMV) retroviral protease, which caused AIDS in monkeys. The puzzle was only available for three weeks. Players produced an accurate 3D model of the enzyme in 10 days – something scientists hadn’t been able to do in 15 years . Next, I’ll mention the International Space Apps Challenge, led by NASA and over 400 other organisations. This is one of my favourite new Citizen science initiatives. Started in 2012, and with over 9,000 people from more than 80 countries participating in 2013, it describes itself as ‘a technology development event during which citizens from around the world work together to solve challenges relevant to improving life on Earth and life in space‘ . Participants – anyone can sign up –are given a number of challenges to tackle over the weekend. This year, they included Detecting Near Earth Objects (or: how I learned to stop worrying and find the asteroid), telling the story of space to the world better and a tonne more. Some of the very real solutions developed included creating data visualisations to improve air traffic control, integrating wind, solar and geothermal energy data, improving local agriculture efforts, making lego rovers, pairing high school girls with NASA mentors, and developing cubesats for upcoming mission . If you’re curious about the Citizen Science movement, I’d really recommend Michal Nielsen’s book ‘Reinventing Discovery: The New Era of Networked Science’. The power of these, and all the other, communities, is enormous when added together They give people a safe space to begin their journey. They give them a sense of community and support. A place to belong. They help people to get their message out there into the huge blue yonder. And they help those messages, be listened to. Is it about a specific topic of interest, such as regional differences in Vulcan hairstyles? Nerds are very, proudly, individualistic. Forming a community which doesn’t take into account the behaviour and characteristics of the people you want to knit together, will result in failure and a heap of disdain. These days, your web presence is how people get to find out about you,and tell their friends. You don’t need to make it yourself (although doing so is incredibly useful experience, I can promise). Depending on the type of community you’re building, you will need different features – forums or chat, or straight blog posts and comments. Maybe just simple event detail postings. Think about using something like WordPress.com (which is free, and very simple to use). There are a number of other free options out there too, though, and each with its own pros and cons – just don’t drop 30 grand on a website for a fledgling community! As to social media? Don’t worry about FB and twitter and Instagram and Vine and blh blah blah. At least not initially. And, regarding Facebook, it’s worth bearing in mind that a growing number of people are very unhappy with FB, and choosing to house your community there could loose you possible members. The alternative to a website is setting up a Google+ community. Now, before you all groan at me, I’ll say it’s a very active place (for people who’re interested in science and tech, at least). But most of the people active on it are in the US, which may not be qhat you’re looking for…. Whatever you choose, though, remember to keep it as simple as possible. You don’t need bells and whistles, and they can get in the way in a bunch of, well, ways. You’re building a community, not a cult, so don’t expect to be the community’s leader, or even have people particularly notice or appreciate your efforts – this can be a thankless task! It will need your love and encouragement, especially in the beginning, to survive. And your patience. Be firm – set expectations about behaviour from the very start. No bullying etc. Or you’ll have a very toxic place on your hands. And get help. No, I don’t mean psychiatric help, although you may end up needing it! Don’t be afraid to ask for it. People love helping out – it makes them feel valuable and useful – and it will make the burdens and responsibilities and work behind the scenes an awful lot less stressful. 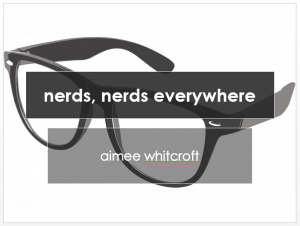 Nerds are everywhere – they’re designing our tech and writing our TV shows. They’re running our companies, and figuring out the solutions to the wicked problems we and our planet face. They’re everywhere, including in this very room. The next nerd nite Wellington, featuring Shaun Hendy, Linc Gasking and Nicola Gaston, is on 16 September! See wellingon.nerdnite.com for details.